Railways of India have finished test runs of the diagnostic railcar with a system for continuous ultrasonic inspection made by TVEMA. This contract for the system complying with Indian standard gauge of 1676 mm was signed by the parties in 2017. The works of mounting the diagnostic systems to the railcar were performed on the premises of locomotive depot of Track Machine Directorate of Northern Railway in Lucknow UP practically in the open air. Nevertheless mounting, adjustment, training of the crew, complex tests and commissioning were completed in the shortest terms. The first test run of the railcar at the operated railway track Lucknow – Utraitia Junction discovered several defects of welded joints that cannot be detected by other NDT tools used by India Railways today. This fact alone proves the value of this project for further development of railway infrastructure in India. Today implementation of this project is under great attention of both Indian Railways and RDSO. Agreement between TVEMA and Indian Railways supposes that in the future cooperation will grow in terms of creating complex diagnostic tools and equipping railcars with video inspection and geo-positioning systems. 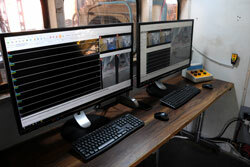 Our Indian colleagues and we agree that this joint project is a technological breakthrough in providing continuous ultrasonic inspection of rails and it can take the traffic safety on railways of India to the next level. As our company experience in international partnership shows, joint efforts in development of railway diagnostics system allowed for great improvement of traffic safety and operational characteristics of railway infrastructure in partner countries.